The laughs are back this spring with the highly-anticipated release of The Loud House: It Gets Louder - Season 1, Volume 2 on DVD, which is following up last years' release of the first half of the season. This two-disc set comes out on DVD May 22 and contains the rest of the hilarious and heart-warming episodes from the show's inaugural season. 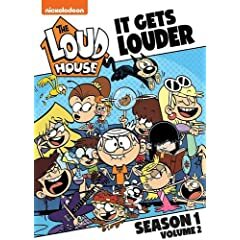 Fans of this chaotic family comedy will see their favorite middle-child continue to navigate how to survive in a house of 10 sisters.Produced by Nickelodeon Home Entertainment and distributed by Paramount Home Media Distribution, The Loud House: It Gets Louder - Season 1, Volume 2 will be available on DVD May 22 for the suggested retail price of $13.99.